I simply love the simplicity of Angry Birds. I love that they are cute and can be transformed to any art project. 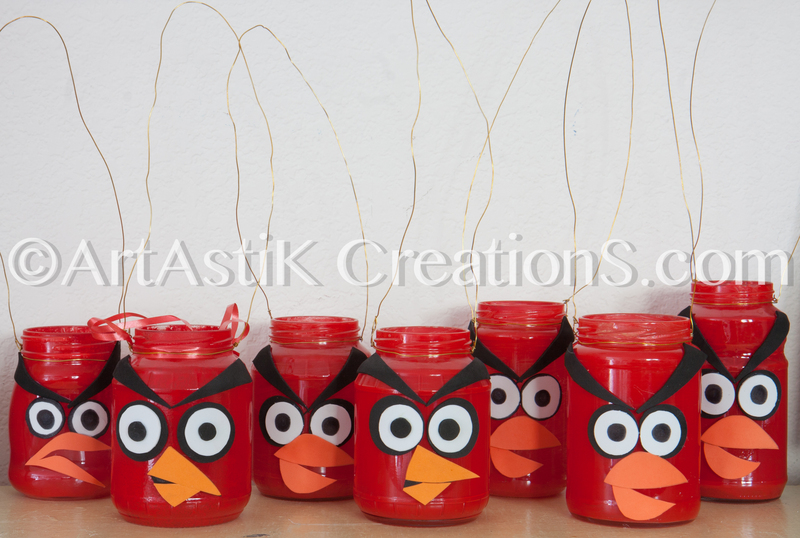 So I decided to transfer my old mason jars/pasta sauce jars to these cute Angry Bird candle holders. Cut foam into circles and the other required shapes. Stick the foam shapes with E-6000 on the glass. With a floral wire, make a loop around the neck of the jar. Place some sand in the bottom of the jar and gently put the tea light in the center. You can also place a few river rocks around the candle for added stability. These were perfect in our backyard in the summer time. Thank you Prajakta! You saw these in action! Keep up the good work , I read few blog posts on this internet site and I think that your blog is really interesting and has bands of great info . Thank you Helena for your warm comment! I am thrilled to hear that you like it! Thank you for your time to send me a line!